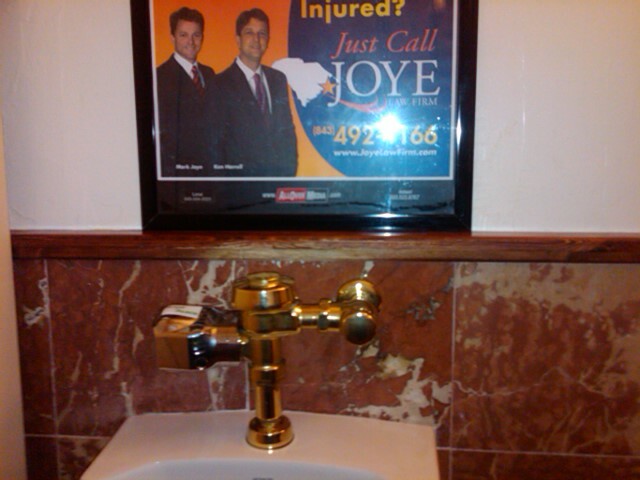 Advertising over a urinal has one thing going for it: A captive audience. But is that really the association that you want for your law firm? From Myrtle Beach, South Carolina, the Joye Law Firm apparently doesn’t have a problem with it, as you can see by these two pictures. When you come to the South Carolina personal injury lawyers at Joye Law Firm after a serious injury or accident, expect to be treated with the utmost respect, compassion, consideration, and care. So how do you respect someone that advertises professional services over a urninal? Scott Greenfield at Simple Justice likes to write about much of legal advertising being a race to the bottom. 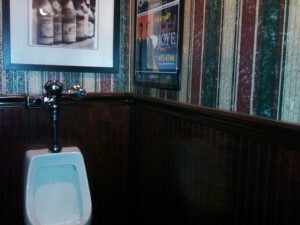 Which means that, to beat this ad, someone will have to advertise inside the stall. OK, so this isn’t new technology run amok; just good old-fashioned tastelessness. Perhaps the Joye Law Firm was hoping, while men held onto themselves, for a play on the firm’s name? Photos courtesy of my spy who wishes to remain nameless. So what? If it connects a person in need of an attorney with an attorney who provides the needed result, does it matter? I have seen many other such ads, for sports teams, or dentists, or others. Are you ready to impugn them also? I would think that, as a trained attorney, you could seperate your gutteral thoughts with the intelectual ones, and figure out that delivering a message of quality would be valuable, even if the location was not. If it connects a person in need of an attorney with an attorney who provides the needed result, does it matter? Yes. It matters. Such ads are seen not only by litigants but by jurors. It has a direct impact in the courtroom when jurors’ minds are poisoned by such crap. It makes it that much harder to try cases when jurors start with a view of disrespect toward those that represent the claimants. And that is particularly important when one has the burden of proof. Above the Law had a post today about humorous lawyer ads, which prompted readers to say that they would be less likely to hire a firm with humorous ads because it makes them appear unserious. I think the issue touches on what you’re talking about here. 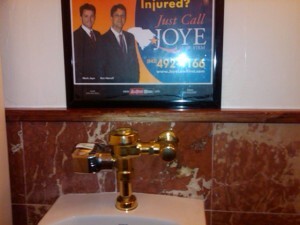 Maybe advertising over urinals could create business. But by doing so, you run the risk of looking crass or even sleazy. Pingback: You found your lawyer _how_? It makes it that much harder to try cases when jurors start with a view of disrespect toward those that represent the claimants. You know, I had not thought of that aspect. But now that you pointed it out, my mind is at ease regarding those ads. If the judicative won’t put a stop to slip-and-fall suits from inebriated sots, if the legislative won’t institute a loser-pays rule to protect against legalised blackmail, then telling the jurors about the level at which “officers of the court” operate may help. The problem with your snark is that you seem to form opinions based on the outlier cases — those that are bizarre and make the news — and want to apply that snark to all the others.